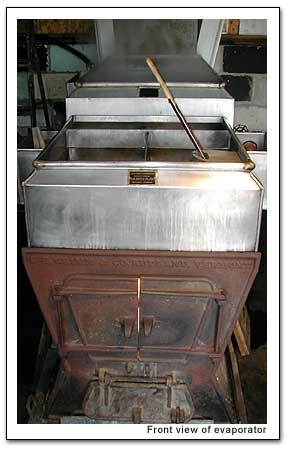 As you can see the evaporator features a two stage stainless steel boiling setup riding on top of a big ol' woodstove. The woodstove is kept well stoked and sap is fed into the tanks to boil down. This smaller setup holds around forty or more gallons in the first stage. The math on making Maple Syrup from sap is easy, if not discouraging: forty gallons of sap gets boiled down to make a single gallon of syrup. With this setup going at full steam, literally, they might pour off a gallon of finished syrup about once every two and a half hours. The first stage of the evaporator is on the right, going at a full boil in this picture. The bubbles were suppressed a few minutes later by applying a single drop of de-foamer. 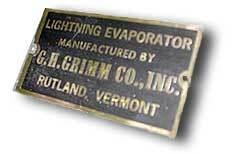 They said that in the old days the syrup makers would hang a piece of pork over the tank and when the bubbles got high enough to touch it the fat from touching it instantly suppressed all of the foam. I didn't get the exact sequence, but at some point the liquid being boiled down in the right side is routed into the left hand tank for the final phase of boiling down. 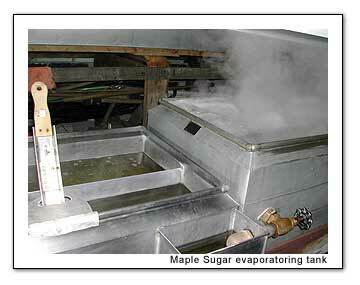 Then it's drained off, cooled, and can be officially called Maple Syrup. How much syrup can you get from 500 trees? Last year they had closer to 400 hundred trees but the sap never really got going and they produced only nine gallons of syrup. During a normal year they can produce as much as thirty or forty gallons.